The federal government hands states about $40 billion a year for transportation, money they can basically spend however they want. The result in many places is a lot of expensive, traffic-inducing highways that get clogged with cars soon after they’re finished. Can measuring the effect of all this spending lead to better decisions? U.S. DOT is developing a metric to assess how well states address congestion. This is a minefield — if the new congestion rule only measures the movement of cars, it’s going to entrench 60 years of failed transportation policy. Unfortunately, the first draft of the DOT rule left a lot to be desired. Reformers have been pushing the agency to revise the rule so it takes a broader, multi-modal view of congestion. Stephen Lee Davis at Transportation for America reports 19 senators and 48 U.S. representatives have written a letter to U.S. DOT [PDF] demanding a healthier approach. If we focus, as this proposed rule does, on keeping traffic moving at high speeds at all times of day on all types of roads and streets, then the result is easy to predict: states and MPOs will prioritize investments to increase average speeds for cars, at the expense of goals to provide safe, reliable, environmentally sensitive, multi-modal transportation options for all users of the transportation system, despite those goals being stated in federal statute. This singular focus on moving vehicles undermines the progress this Administration has made on multi-modal planning and investments through the TIGER program. Encouraging faster speeds on roadways undermines the safety of roads for all users, as well as the economic vitality of our communities. 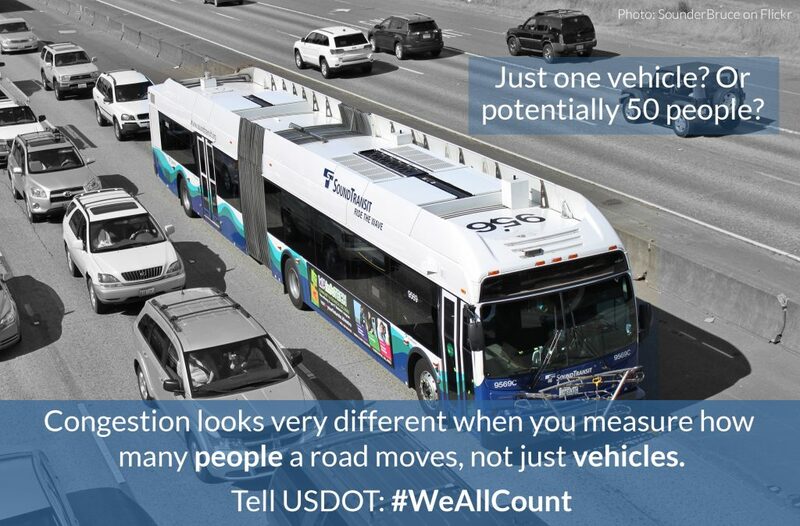 The excessive congestion performance measure should be amended to assess people hours of delay and not just vehicles. This change is critical to account for the many non-single occupancy vehicle users, including transit bus riders and bicyclists and pedestrians traveling along the corridor, which provide critical congestion relief and could be undercounted or even penalized under this measure. The letter also insists that U.S. DOT require state and regional transportation agencies to assess the impact of projects on greenhouse gas emissions. U.S. DOT is currently accepting comments about the rule change. You can weigh in and help promote a better policy. Elsewhere on the Network today: The Transport Politic offers a side-by-side comparison of the Republican and Democratic transportation platforms. Bike Portland highlights a study that found streetcar tracks cause a large number of cyclist injuries in Toronto. And The Fifth Square wants Philadelphia Mayor Jim Kenney to enforce parking rules on South Broad year round, like the city is during the DNC. Hundreds of billions of dollars have been spent in the quest for free-flowing vehicular traffic. The result is wider highways, more sprawl, and more people stuck in congestion. But this week U.S. DOT took an important step to change course, releasing new standards to guide how transportation agencies measure their performance. Advocates for transit and walkability say the policy is a significant improvement.